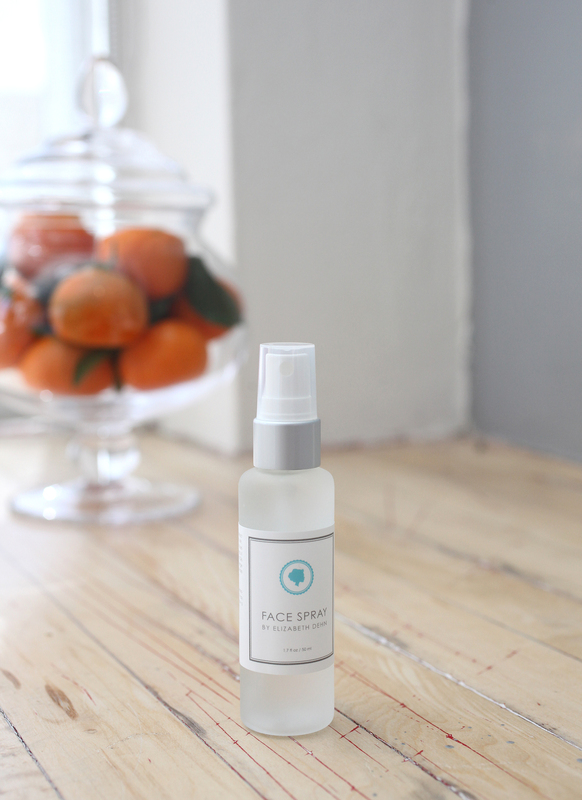 [closed] giveaway: win a bottle of by elizabeth dehn face spray! As you might already know, I’m honored to be a part of the blogging team over at Beauty Bets, an award-winning beauty website created by Elizabeth Dehn. I can hardly believe it, but it’s been nearly a year since my first post! Time certainly flies when you’re having fun. Especially when your definition of fun means test-driving a budget beauty products day in and day out! This year’s been full of entrepreneurial adventures and growth for both Elizabeth and me, but one MEGA HUGE ACHIEVEMENT that deserves extra-special attention is the debut of Elizabeth’s eponymous skincare line: By Elizabeth Dehn. Unsurprisingly, the collection is ALL killer and NO filler. Juicy, nutritious ingredients and effective formulas, finished off with the prettiest of packaging. Also not surprising? The heaping amount of praise the collection continues to rake in. One product that has Bets running back to bottling plant already is her Face Spray, which I think should be renamed Change-Your-Day Spray. Just a quick mist of this heavenly scented stuff can quite honestly turn my entire outlook around! Besides being an instant mood-booster, the addictive spray’s infused with organic sweet orange and melissa essential oils and packed with antioxidants. With every spritz, you feel as if you’re doing something good for your thirsty complexion—because you ARE! 1. Be a U.S. resident. 3. Leave a quick comment on this post telling us why you could use a mood-boost in a bottle along with a valid email address. Show me you tweeted about this giveaway, and I’ll give you two shots at winning! This giveaway closes on Thursday, June 16th at 8 p.m. CST. I wish you luck, y’all! This entry was posted in Giveaway and tagged Beauty Bets, By Elizabeth Dehn, Elizabeth Dehn, gettin pretty, giveaway by highplainsthrifter. Bookmark the permalink. I have super sensitive skin, especially in summer, and my face would love this! And who’s going to turn down a chance to smell pretty and look refreshed?! I would love to be the owner of this face spray because I have a son that is 18 months old and I chase after him and work full time and also have a side photography business and he smears his grubby toddler hands all over me and sometimes I don’t have time to shower until the end of the day and even then sometimes I just collapse onto my back in the bed and stare at the ceiling and just enjoy not moving and it sure would be nice to have a refreshing face spray at a moment like that! I would absolutely LOVE to win this. I’ve been pretty stressed lately, and maybe this is just what I need for a pick me up! Plus, my skin is so dehydrated. This humid weather has me down. first of all, i love elizabeth and beauty bets! i need a mood boost because i’m pregnant! :) and it’s about to get HOT! thanks for the opportunity, meghan! I have heard SO much about the spray and I’m dying to try it. I SOO need a -Change Your Day Spray!! I work in an office where I help people daily change their lives. Sometimes it would be nice to have a change for me! What a better way than some a spray that is good for me! Thank you! After a big weekend up north, I needed a few extra days off to recover but instead, I’ve already had a bunch of work fires to put out at the office. A nice spritz of face spray (possibly several times a day) would definitely get me through it looking and feeling a bit more chipper! This would be a great mood-boost for a recent college grad because we all know the economy isn’t providing any mood-boosts right now. It will give me a fresh face for interviews! I live in the Deep South, where temperatures are already reaching the hot and humid high nineties! A face spray from Bets would be just the thing to ease my “oh my GAWD, I can’t stand this HEAT!” typical summer complaints! I’d spritz it on my face and cool off with the little Japanese fan I keep tucked in my purse at all times. This would be a perfect spray for someone like me who is constantly on the go. Whether its traveling for work or after a yoga class, a spritz of this spray can instantly refreshen me so I can tackle the rest of the day. I would use the face spray as I will soon (in a few short months) be a Mom of two!! Ah!! & I tweeted (sounds innapropriate huh??). Weird, that is MB from Top Drawer Vintage but it automatically logged me into an old wordpress account! It’s me, it’s me! I’m home with the kids this summer in ultra humid and hot South Florida and what better way to stay refreshed and calm!